The before and after Face Laser Resurfacing photo is a wonderful example of how a combinations of procedures can produce an excellent result. In the Face Laser Resurfacing before photo, one can notice a number of changes. Firstly, the skin is wrinkled and this particularly noticeable across the forehead, around the eyes and the outer cheeks. These lines occur from sun damage and smiling and frowning. Secondly, one cannot see the upper eyelids because of the excess skin and fat that is sagging between the eyebrow and the eyelashes. Finally, the face does appear to be drooping and sagging. The combined approach here was aimed at getting a better skin surface through laser resurfacing, opening up the eyes through laser blepharoplasty, and as a result, there is some tightening and contraction and face lifting of the skin. 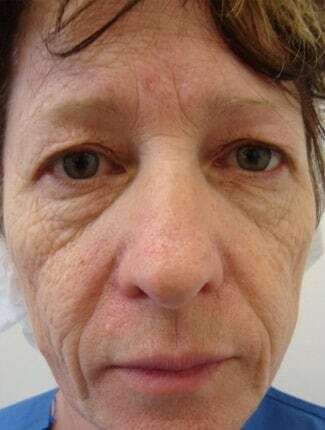 It is important to note that this is a makeover case which demonstrates the advantage of applying makeup after face laser resurfacing and blepharoplasty. Makeup enhances and makes the results appear more natural. Makeup also covers the initial redness that is seen with face laser resurfacing. IN WHAT WAY DOES THE FACE LASER RESURFACING WORK TO IMPROVE SKIN TEXTURE? Sun damage occurs because of solar damage on the outer 2 layers of the skin which is the epidermis and dermis. By performing laser resurfacing, these 2 layers are removed and a new layer is created from cells that lie deeper along the hair follicles. This is the reason why laser resurfacing is so much safer on the face than anywhere else on the body because there are many hair follicles and an excellent blood supply. Our initial laser resurfacing was with the CO2 lasers. Over a period of time, different lasers came out. I bought and tried many different lasers. Today I find that the most effective and safest is contour erbium laser. This allows me to control the depth of the vaporisation and I get a very controlled healing time. In some areas we do the laser very gently as in this case across the nose and chin. In other areas, we will go very deeply such as on the forehead and around the eyes and cheeks. HOW LONG WILL THE FACE LASER RESURFACING LAST? 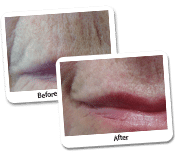 Laser resurfacing can last for many years if not a lifetime. Patients are encouraged to apply makeup to protect themselves from the sun. Sometimes it is a good idea to use muscle relaxants to prevent further creasing and smile lines particularly around the eyes and forehead. HOW DID THE LASER BLEPHAROPLASTY WORK IN THIS CASE? The laser was used in 3 modes. First of all, the upper skin was cut out. An incision cut was made deep in the upper eyelid in the crease. This removed the excess skin. You will notice that although we’ve opened up her eyes and one can now see about 4 mm of her upper eyelid skin, she does not have a startled appearance. That is because we did not do a brow lift. The brow is still in the same position and this is something that could be addressed later with the facelift or brow lift. As a result, the eyes, I believe have a very natural appearance and she probably looks how she did perhaps 25 years earlier. Because she now has an upper eyelid she is able to put the mascara on which one can see as well as the eyelid shadow. You will also notice that I took the fat from the lower eyelid. Lower eyelid fat is called fat bags. This produces a convex shape with a shadow below it. In the photos one can see this more obviously on the right side. By removing the fat from inside the eyelid, there are actually no cuts or scars on the surface. The 3rd and final changes that we did was the laser resurfacing on the actual skin which we have discussed. Before and after photographs such as these are very useful for patients to understand what can be obtained with combining procedures. IN THIS CASE WHAT ELSE COULD BE DONE? One would notice that she does have a depression on her cheeks. It is more obvious on the before photo where she had the looser skin but one can still see that her cheeks are slightly shallow. In this situation, I would look at using a filler. 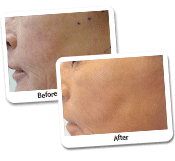 We used dermal fillers that are manmade or we take fat from other areas of the body and inject it into the area. The advantage of fat is that it is the patient’s own tissue and possibly could last a lifetime. HOW LONG WOULD ONE EXPECT THIS RESULT TO LAST? I would expect the blepharoplasty and laser resurfacing to be a long lasting result. I find that these 2 procedures as well as liposculpture such as liposculpture of the neck tend to last for many years and it would be unusual to have to go back and redo these areas. I could imagine that in the future this lady may look at a face lifting procedure such as mini facelift or brow lift depending on how she aged as time went by. 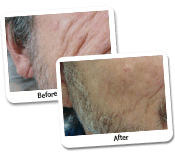 Click here for for more before and after photo’s of Erbium procedures.